09. Decade End (3:39) " "
10. Pro People (1:22) " "
12. Edisonia (2:27) " "
02. From Her Journal (2:27) " "
AMG REVIEW: By 1988, R. Stevie Moore was 36 years old, and he had been making his own home-recorded tapes for 20 solid years, developing no more than a committed cult following even as his songwriting and performance ability grew like kudzu on a humid summer night. So that year, he stopped, quietly. For the next three years, R. Stevie Moore made no new music, instead appointing himself "curator" of his enormous tape library and channeling all of his creative energy into a similarly expansive collection of videotapes (which, like his CDs and LPs, are available at www.rsteviemoore.com). 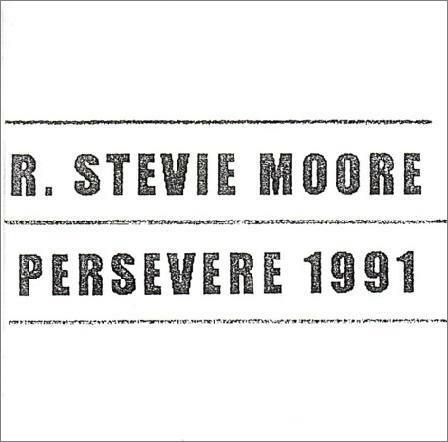 Of course, such a state of affairs was never going to last, and in 1991, Moore released his first collection of new recordings in three years, the optimistically-titled Persevere. Moore sounds renewed by the time off, and the lengthy album (two discs in the remastered CD version, including the entirety of 1992's mostly instrumental Recital) is filled with gems. The album opens with "Dryshave," an interview from the legendary Uncle Floyd Show that touches on Moore's temporary retirement from music, a topic that's also addressed on the spooky, echo-filled title track. However, the album truly takes off with the spellbinding "Oil," an eight and a half-minute collaboration with Frank Balesteri, a close friend from Moore's days at the freeform radio station WFMU (where Balesteri was better known as the on-air personality Vanilla Bean) that's a shockingly effective example of cultural cross-pollination: a woozy, rhythmically challenging piece of politically-charged hip-hop (lyrics and vocals by Balesteri, music and production by Moore) that not only doesn't sound like the work of a pair of white guys in their 30s, but stands up next to most of the then-emergent underground/alternative hip-hop releases. Other highlights include an oblique multi-part suite of songs related to fellow New Jerseyite Thomas Edison, an utterly wonderful country-tinged cover of the Bonzo Dog Band's lovely "Ready Mades" that evolves into a hazy psychedelic jam before turning in upon itself and respooling completely backwards and the growling electro-funk of "Times Have Changed," the album's primary fan favorite.